Dale Stith............................... 918-760-1550, Cell Ramada Inn .................................. 540-434-9981 Sale Day Phone: ......................... 540-333-1019 or The Village Inn ............................. 540-434-7355 540-848-4834 Holiday Inn Express ..................... 540-433-9999 Super 8 .......................................... 540-433-8888 REPRESENTATIVES Country Suites .............................. 540-433-2400 Bobby Grove ................................. 540-850-0266 TRUCKING Charles Strickler ........................... 540-923-4717 Tommy Coley ................................ 815-988-7051 Every effort will be made to help you get your animals transported. LUNCH WILL BE AVAILABLE INSURANCE Available through Jerry Gay of Harding and Harding Inc. See the clerk. DIRECTIONS: From I-81 use Exit 243, turn left on Route 11, south 1 mile to Rockingham County Fairgrounds on right. Live internet bidding at Virginia Beef Expo provided by Cowbuyer.com. See page 12 for more information. Mid-Atlantic Spring Bonanza Sale • A pril 18, 2019 • 12:30 p.m.
Service Sire of Lot 12 — R Landmark Mid-Atlantic Spring Bonanza Sale • A pril 18, 2019 • 12:30 p.m. Personal note from Don Richardson: Bob Schaffer of Deer Track Farm picked up 7 bovines of mine early in December, took them to his home and has taken incredible care of them. D78, and all my fall bred heifers, E03, E04, and E09 (Lots 13-15) were among those 7 bovines that Bob fed, treated, and babysat. Thank you so much, Bob! BBF Chuck Y33, out of VHA Bull Development Program, sire of RBF Farleys JoJo (Lot 44) and RBF 11S Abigail Dividend (Lot 45). With Felton and Victor bloodlines, packed with SODs and DODs top and bottom. 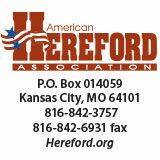 Breeding high quality Hereford cattle is our passion Bulls and Heifers available year round by private treaty! For more information visit our website at www.herefordhollowfarm.com, contact Joel at 276.759.1675, or email us at herefordhollow@gmail.com Make sure to check us out on Facebook! 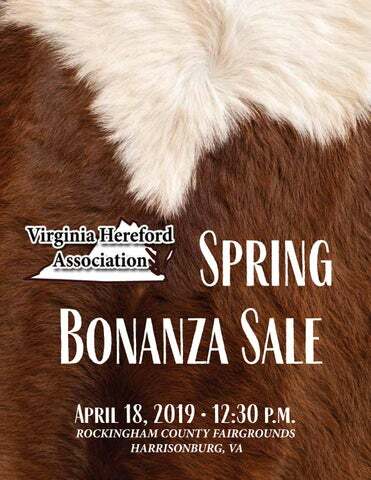 Make Plans to Join Us for the 2019 Fall Bonanza Sale November 9, 2019 Rockingham County Fairgrounds, Harrisonburg, VA Mid-Atlantic Spring Bonanza Sale • A pril 18, 2019 • 12:30 p.m.
Set up for a great weekend!!!!!!!!! consignor is the owner of co-owner of the AI bull. 7. Health: All cattle selling will have health charts for interstate shipment and will have been tested for TB and Bangs within 30 days of the sale. 8. Guarantee: The laws of the State of Virginia shall govern the validity of this sale, the construction of its terms, the interpretation of the rights, duties and obligations of the buyers and sellers, the enforcement of its terms, the remedies upon breach and all other matters relating to this sale. The exclusive venue and forum for any legal disputes between the parties shall be either in the Federal District Court for the eastern section of Virginia or in a state court of competent jurisdictional defenses that each may have to the institution of such an action in such courts. 9. Responsibility: All persons attending the sale do so at their own risk. Neither the Virginia Hereford Association nor the Rockingham County Fairgrounds will in any way whatsoever assume liability, legal or otherwise, for any accidents or injuries that may occur.